In Mozambique, the efforts of the Ministry of Coordination and Environmental Affairs (MICOA) together with civil society actors to put communities at the center of climate change adaptation planning are now paying off, with the first Local Adaptation Plan (LAP) being approved by the government of Mozambique in Guija district. We asked Melq Gomes, who has been leading ACCRA consortium work with a solid team and committed members of the government for 3 years, to give us an overview of this new policy environment, how it came to life and how it generates accountability to those affected by a changing climate in this country. In Mozambique there is a strong feeling of commitment to a decentralized and inclusive process for planning at the district level. A technical meeting in Maputo demonstrated this in June 2014, as representatives from several Ministry for Coordination and Environmental Affairs (MICOA) departments, the Africa Climate Change Resilience Alliance, and advisors linked to UNDP and DANIDA got together to review and share their reflections on the exercise of development of Local Adaptation Plans (LAPs) in several districts. The first experiments with the LAP are now becoming part of the national planning process in a very dynamic way. The voices of men, women, youth and children, their knowledge and day-to-day experience are being heard by the state, and are being institutionalised and responded to. The workshops, which are led by the Government and supported by civil society, are designed to contain no jargon but are tailored to communities that already understand the need to adapt and create a resilient space. The Government of Mozambique is institutionalizing the good practice experienced in this process by reflecting the outcomes of consultation with citizens in the district development plans. This is part of the first phase of the implementation of the recently adopted National Strategy for Adaptation and Mitigation of Climate Change in November 2012. This, coupled with the vision of decentralized planning in Mozambique has established a fertile ground for technical experts and district governments to work in strong collaboration, which has already resulted in a level of success registered in the field. This policy framework, when implemented effectively, can reward the efforts of committed experts at various levels of government. The development of the LAPs provides an opportunity to integrate various sectors and services at the local level as well as directly influence the national budget. Information from this climate sensitive planning at the local level can be used at the national level to prioritise activities which contribute to building resilience by using the existing framework for planning development and its institutions in the country. A LAP process guideline lists and summarizes key steps developed over the last year - an effort that brought together a number of MICOA and MPD technical staff at the central level. The officials attending capacity building programs actively supported the design of the methodology applied to the process and took leadership of the work undertaken within community consultation, in close cooperation with provincial and technical staff of the districts. This work included the Provincial Agency for Environmental Coordination (DPCAs), district government representatives, as well as technical services pertaining to district planning and infrastructure (SDPIs) and district departments of economic activities (SDAEs). ACCRA technical support was instrumental in this work particularly in convening a group of leaders: men, women, youth and children under the coordination of the national consortium member University of Eduardo Mondlane. The project will continue to advocate for plans and budgets developed by the Ministry of Planning and Development (MPD) to reflect the efforts made in the development of LAPs. ACCRA will recommend that the existing specific budget line for adaptation activities (MC004) is better utilised and establishes close links between the components of monitoring and evaluation of the most central level with those established in the LAPs. 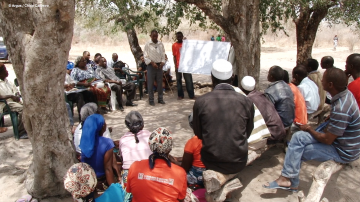 This video-documentary sponsored by ACCRA and DANIDA illustrates every step of the Local Adaptation Plan process in Guija district, Mozambique. View the 1 page summary of the LAP guideline in English here. ACCRA has contributed to the development of a toolkit which supports those responsible for developing the district adaptation plans. This toolkit drew on existing information already developed by ACCRA alliance members and key partners, such as the Community Vulnerability and Capacity Assessment (developed by CARE) and the Theory of Change developed by the Tracking Adaptation Monitoring Development (TAMD) program run by the International Institute for Environment and Development (IIED) and Save the Children, which started with training of trainers of MICOA and MPD central level staff. ACCRA members in Mozambique actively participated in the project. Save the Children led the development of the LAPs in the districts of Guija and Chigubo (Gaza province); the former being the site of initial studies and pilot activities which generated the evidence and tools necessary for LAP development. In July 2014, Guija became the home district of the first approved LAP in Mozambique. Oxfam through partners (FACILIDADE) took the lead in the district of Mongicual and CARE in Angoche (Nampula province). World Vision covered Mopai and Morrumbal districts in Zambezia province. How can Ethiopia do better at mitigating disaster risk and adapting to climate change? Using a local adaptive capacity framework as a starting point, this research paper analyses 7 case studies from across Africa and Asia that represent a range of different interventions. In this video stakeholders explain how a game has raised their awareness of the importance of developing cross sectoral projects, keeping options for the unexpected and finding long term solutions.